Yesterday was day one of transformation competition on my coach, Jaco De Bruyn’s website. I took my initial pictures, which was terrifying. 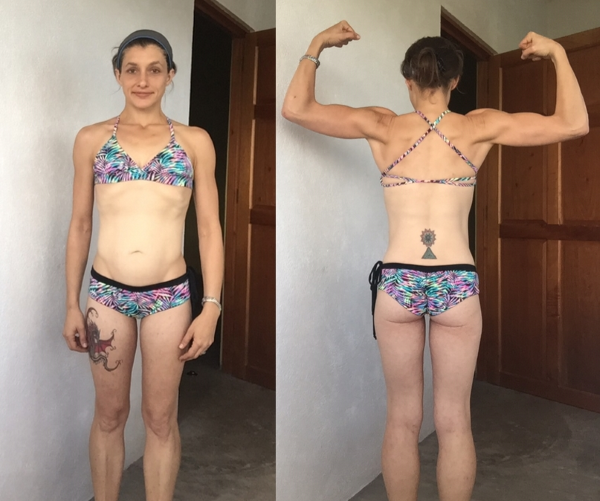 It’s a straight up real bikini, not the boy short bottoms that I’ve using for my progress pics. I know that extra couple of inches worth of material doesn’t seem like much, but it is, it really, really, is. But, posting pictures wearing the boy short bottoms was also initially terrifying. I had only worn skirted bathing suits since I think middle school. Until recently, just the thought of showing my stomach and thighs in public or online would make me cry. Literally, just thinking about it, would make me cry. My hand still shakes a little every time I post, but a little less each time. Getting over that panic-inducing fear, that’s what part of all this is. Lifting, joining the academy, entering the transformation competition, admitting these embarrassing thoughts and feelings to anyone reading this, all for being entirely comfortable wearing a somewhat skimpy bikini. It’s a lot to put on two little pieces of material, but it’s my personal anti-totem, my thing. What I see as the last hurdle to jump over to truly being comfortable in my skin. I haven’t been since I was eight. It’s been almost thirty years. It’s time. Next week, I’ll let you know how week one went.